This book is like chocolate and kittens, it made me feel all warm and fuzzy inside. 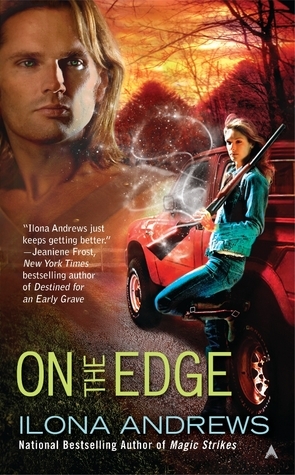 On the Edge may not technically be as good as Andrew's Kate Daniels series (in the opinion some), the characters may lack Kate and Curran's depth, but I don't think you'll care one bit. I didn't. I loved every minute of it and anticipated picking it back up every time I put it down. It was funny, light (well light for UF and light for Ilona Andrews for dang sure) and satisfying. The romance was steamy and enjoyable but it didn't overshadow the story or the personalities of the characters. The romance also had conflict without a lot of angst and drama. Sign into Goodreads to see if any of your friends have read On the Edge.